Photo courtesy of Fastpitch Coach Jen Smith. The Lady Cruiser fastpitch team didn’t kick off the 2019 season like they had wanted. On March 11, the Cruisers played host to the Spanaway Lake Sentinels in a non-league game. Coach Jen Smith gave the opening day start to sophomore pitcher Haley Olson. The Sentinels got to Olson early with two runs in the first and second innings. Freshman Berkley Porter came in to relieve Olson in the thirds and things turned around when a pop fly and a double play got Porter out of the inning after facing only four batters. The Cruisers struggled at the plate picking up three hits in the second inning and then Spanaway Lake’s defense would hold them hitless the remainder of the game. The Cruisers gave up another run in the fourth and then five more in the fifth to take the loss, 10-0 in five innings. Hoping to bounce back from their opening day loss, the Lady Cruisers played host to the North Mason Bulldogs on March 13. Haley Olson stared again for the Cruisers. The Bulldogs scored three quick runs on the first inning, but the Cruisers answered back. Brooklynn Lucht drove in Hailey Rath and Madison Miller as the Cruisers began their comeback. The Cruisers added another run in the second inning to tie the game at three before the floodgates opened for them. In the fourth inning, the Cruisers plated six runs. Brooklyn Lucht led things off in the inning by launching the first pitch she saw over the right field fence. The Cruisers scored three runs in each of the fourth and fifth innings to down the Bulldogs, 15-5. Lucht enjoyed a 3-4 day with two homeruns and driving in four runs. On the mound, Olson got the win going five innings, giving up five runs on three hits, walking six and striking out three. 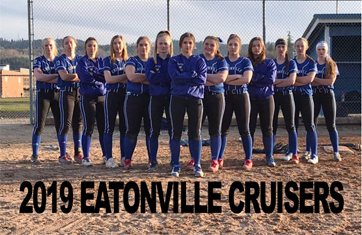 The Lady Cruisers traveled to Tacoma to take on the Foss Flacons on Friday, March 15. The Lady Cruisers wasted no time getting on the board. In the first, with the bases loaded, Brooklynn Lucht got things going with a triple to center field that scored all three base runners. Lucht collected four more hits in the game on another triple, a double and a single. She ended up driving in seven runs on the day while scoring four times herself as the Cruisers slid to a 30-1 victory to improve to 2-1 on the season. Hailey Rath hit a homerun for the Cruisers as well.